The valiant fighting WWE World heavy Weight Champion, Seth Rollins started the night and was flaked by his security team and the Director of Operations. Our beloved savior of the WWE gave those who missed Extreme Rules a run down of how he single handedly beat Randy Orton with an SKO (Seth KO, so see wasn’t an illegal move, since it was clearly completely different). He gave props to Kane, who was a phenomenal crypt keeper..uh.. I mean Gate Keeper for the match. This brought out Roman Reigns who insisted that HE be given a shot at Rollins’ title since he had become the Last Man Standing by defeating the Big Show in his match at Extreme Rules. Kane had a “better” idea. Since he felt both me had a valid point, he was going to let the WWE Universe decide who would face Seth at Payback. He also set the main event as himself and the Champion versus Randy Orton and Roman Reigns. Later that, however, the Corporate Demon added a third option for the WWE Universe of both the Viper and the Samoan Superman in a Triple Threat match against Seth Rollins for the title. The very first match of the King of the Ring tournament was between Bad News Barrett and Dolph Ziggler. It was a hard hitting back and forth athletic display that was interrupted by Sheamus. The Celtic Warrior came out when it appeared that the Show Off was about to put away the 5 time Intercontinental Champion to remind him of the “full Irish Moon” that Ziggler had gotten up close and personal with. This distraction allowed BNB to hit Ziggler with the Bull Hammer to pick up the victory and advance into the next round of the tournament. This match was reminiscent of battles that the two have had in the past over the IC title. Wade’s physical brawling style has always meshed well with Ziggler’s more technical and showy. It’s like a nitty gritty contrast that always produces amazing results. It seems that Sheamus is not finished with his business with Ziggler and he looked to continue the humiliation from the previous evening. Bad News however, got to move on thanks to the assist. This tournament is in for a bit of bad news if his fellow competitors thinks that he isn’t going to do everything in his power to make sure it’s his hind end sitting on the throne. Just 24 hours after losing the WWE Tag Team Titles, Tyson Kidd found himself in a short match against Big E. The fact dropper held his own against the power house as he used his speed and agility to keep Big E on the defensive. The New Day member picked up the win after a huge clothesline to the smaller wrestler, but the credit goes to Xavier Woods who held Tyson’s foot down and prevented him from kicking out. This was not the match I expected but it was a treat. Even though it was short it advanced this heated feud another level. The New Day’s new tactics to ensure their wins is a bit refreshing, they are taking to the Heel Side of things beautifully. It does appear that Tyson and Cesaro going to have to step up their game if they expect to get those belts back any time soon. Bo Dallas took exception to being interrupted and destroyed at Extreme Rules. As he came out he offered Ryback the chance to leave the ring. The Big Guy answered this by destroying Bo once more. Sure Bo got in some offense but a meat hook clothes line and a shell shock ended his inspirational return to Monday Night Raw. As Ryback celebrated, the lights went out and low and behold, Bray Wyatt struck! He Sister Abigailed the Hungriest man in WWE’s face into the mat and then disappeared into the night! Well that was fun. Sometimes it’s awesome being right. Sure I only put two and two together shortly before the big reveal but hey, I put the pieces together! *happy dances* As for the match… It went as expected. Poor Bo Dallas will just have to Bo-lieve himself into another victory. I am looking forward to seeing how this thing between the Eater of Worlds and Ryback develops. Payback, here we come! The face that thinks it runs the place then opened the challenge for his United States Championship. Who answered? Heath Slater! But before he could make his way to the ring, Rusev attacked and addressed John Cena. He assured Cena that he would make the leader of the Cenation say I quit. I really wish that Heath Slater would have been given his chance to face Cena. Perhaps it will be three times a charm the next time Cena issues the open challenge. The exchange between Cena and Rusev though was a bit dull. The only thing that has me excited about their match at Payback is the fact that if Cena loses, we won’t see him again. The next match n the first round of the King of the Ring saw Stardust go head to head with R-Truth. Both men were eager to move on to the next round and went blow for blow and move for move. Stardust was aggressive and the “Cody” chants did not seem to get under his skin, however, his enthusiasm was not enough to put Truth away as the cosmic would be king was pinned by R-Trizzle. This match was a bit on the short side, but what happened in the ring was a bit of fun. I must say I was surprised when R-Truth won. i’m so used to seeing him lose I almost wondered if I was dreaming. But alas, I was not and poor Stardust is left to watch from the side line as Truth advances in the King of the Ring tournament, bringing the WWE Universe one step closer to a ban on spiders! Fandango once again squared off against Adam Rose. The dancing competitor owned most of the match, but Rosa Mendes appeared as a Rosebud and distracted her former boo and allowed Adam Rose to capitalize to pick up the win. After the match, Rosa then flaunted her new man in an attempt to make Fandango jealous I guess? She and Rose locked lips in the middle of the ring in a way that made me wonder how far this was about to go. I think it’s fun that these two are getting more TV time. But it still kinda feels like a battle of the jobbers. All they need now is to throw Jack Swagger in there to get a jobber hat trick. But hey, if one of them is elevated from jobber status with this rivalry, I’m cool with that. Loser has to keep Rosa though, she’s useless. Naomi was looking for retribution on Brie for costing her the Diva’s title at Extreme Rules and she got it. Brie was no push over though, she came out swinging but was quickly shut down by the former funcadactyl. Naomi dominated most of the match with her aggressive hard hitting style and punished Brie repeatedly. But Brie mounted a short come back as she laded a missile drop kick on her opponent. However, it was not near enough as Naomi rolled Brie up in the ugliest inside cradle I have ever seen for the win. I’m so loving this new Naomi. I giggle with glee every time she does something that makes people wonder what has gotten into her. i’m all sat here cheering her on. Love this hate on for the Bellas that she seems to have. possibly because it mirrors my own hate for them. Speaking of the Bellas, when did they become goodies again? I’ve got whiplash from this most recent turn from the ways of my people. The third match in the first round of the KotR tourney, saw the Lunatic Fringe and the Celtic Warrior tear into one another in the hardest hitting brawl of the night. No punches were pulled and Ambrose caught a beating from Sheamus that was not for the faint of heart. But the Unstable one mounted a come back and looked to take the match there for a moment when he drove Sheamus outside the ring. But one Brouge Kick later and Dean was laying on the ground as the ref counted. But Ambrose would not have to worry about getting counted out, for the match ended when Dolph Ziggler flew out and attacked the roided up albino rooster, forcing the DQ on Ambrose and allowing Sheamus to advance in the tournament. I want to see Sheamus and Ambrose fight again. This match was a feast for my eyes in that there was nothing pretty about it. It was just an all out brawl that made my squeal giddily with each blow that these to men traded with one another. Ambrose kept with his eccentric style and you never really knew what he was going to do next. Dolph coming out to force the DQ was a little disappointing but it again just adds another layer to to the battle going on between him and Sheamus. Now I wonder what kinda retribution will Ambrose extract on the Show Off for costing him the match? After losing the Miz brand last week, the WWE universe was left wondering what was next for Damien Sandow. Well, this week, he decided to address the questions by giving us a brief history on why he had done all the dressing up and such, it was to entertain us, the fans. He said that his time as Mizdow gave him something that he cherished more than anything, the respect of the WWE Universe. As far as his future, he wasn’t sure what it held. And before he could elaborate, Curtis Axel interrupted him. The Axe Man got into the ring and demanded that Sandow exited because if there was one thing he hated, it was a man who didn’t know who he was pretending to be someone else (I know… I laughed too.) Sandow then began to mirror Axel and much to Curtis’ frustration, did not stop. It ended with Damien tossing Axel out of the ring and celebrating. What? Not sure but it was fun anyway. The WWE universe was treated to a bit of heart felt openness it doesn’t typically see from Damien. And he was thanked for it ( to which he promptly said, you’re welcome and we all giggled like school girls) No clue what to expect from this but I am loving Sandow getting the adulation he so rightly deserves. The man that gravity forgot took on the man that soap forgot in the final match of the first round of the king of the ring tournament. At first glance one would think Harper would steam roll over the high flyer easily. 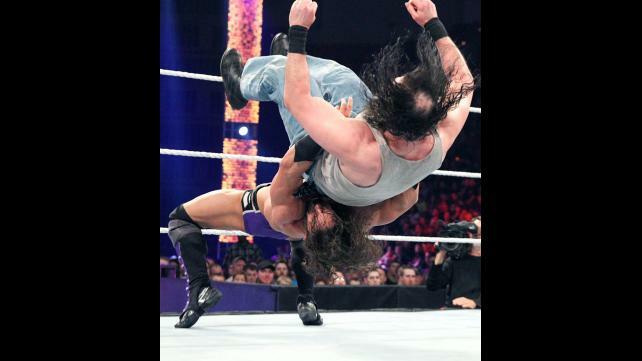 But Neville proved that he was more than just speed as he threw in a few unexpected moves, like suplex of his own. Luke tried to ground Neville with submission holds but it was not meant to be as Neville landed a Red Arrow for the win and advancement into the King of the Ring Tournament. Neville has been on fire since his main roster debut. He hasn’t won every match, but he has looked spectacular in every match. There are so many people I want to see him face off against that my brain is exploding with the possibilities. This match was definitely a stepping stone to bigger and better things. Kane and our beloved champion appeared to be on the same page going into this match as they shook hands and set out to destroy Roman Reigns and Randy Orton. The two men who know what is best for business set to dismantling their opponents as only they were able as they used team work and quick tags to ensure that momentum stayed with them throughout most of the match. But The Viper and the Samoan Superman battled back and got off a decent offense of their own but it was shut down once the Director of Operations made his presence felt once more. However, the tides of the match turned when Reigns was able to power out of a choke slam attempt. Rollins only seeing that his team mate was in trouble, went to drop kick Roman, but accidentally misjudged and drop kicked Kane right out of the ring. The night would further disintegrate as Rollins, again seeing that Kane required his help, suicide dived on what he thought would be Randy and Roman. But the two quickly got out of the way, and Kane took the brunt of the attack. Now, Kane lost his cool and went berserk. 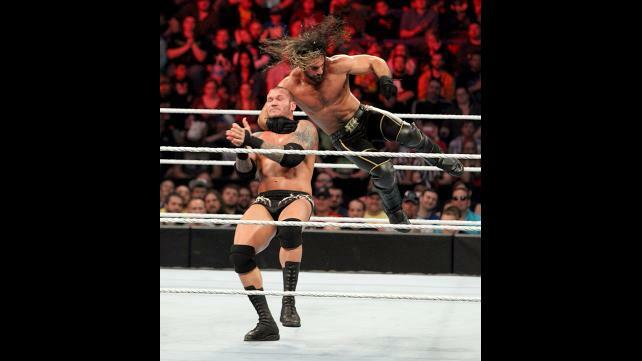 He assaulted Rollins and tossed him back into the ring where he caught an RKO and a spear. The Corporate Demon then stood idly by as Rollins was pinned. After the match, Kane revealed the results of the WWE app poll on who would be Seth Rollins’ opponent at Extreme Rules. Would it be Randy Orton? Would it be Roman Reigns? Or would it be both men? Turns out the WWE Universe is a blood thirsty and sadistic lot as it was an overwhelming 78% for a triple threat match at Payback in three weeks. Kane has lost it. He is corrupted by the power he wields and the jealousy he feels for someone more talented than he is and he is taking it all out on an innocent Seth Rollins. I abstained from voting as it would have been a blatant betrayal towards our beloved WWE World Heavy Weight Champion to participate in such a barbaric vote. He has beaten both Reigns and Orton and does not need to prove his superiority over them because he already has. And now he will have to beat them both in one night. I have complete faith in the Architect, but Kane needs to be punished for such a brash and irresponsible and clearly not best for business decision. This entry was posted on Tuesday, April 28th, 2015 at 11:44 pm	and is filed under Events, News, Television. You can follow any responses to this entry through the RSS 2.0 feed. You can skip to the end and leave a response. Pinging is currently not allowed. « Who’s Been Nominated?! 2015 Tony Award Nominations Run-Down Is Here!! !